Elena: [referring to the meal] It's unusual... is it quail? Q: Why was Elena upset when she found out that she was eating pigeon? Q: How do the Knights expect to destroy America with bars of soap? ...it's quite alright for a one-time watch. I enjoyed watching Catherine and Antonio together again as Zorro and Elena but their chemistry was less electric than in the prequel. The film itself is a little slow-paced with loads of over-the-top stunts. Then there's also the unnecessary 'save America' bit which just seems to be a necessary formula for all Hollywood superhero films. Some well shot scenes include the dance scene at the party (no, it's not the flamenco) that has a touch of humour. Cinematography is quite good and the locations are beautiful. 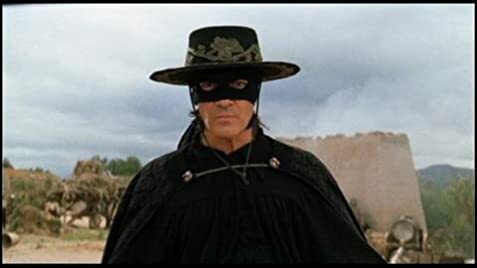 In a way it does stay true to the first movie as this time we see both Elena and their son Jaoquin fight by Zorro but it lacks the heart, the natural humour, the energy and passion of the wonderful prequel. Direction isn't completely up to the mark as some scenes seem to have been cluelessly shot. But on a more positive note, 'The Legend of Zorro' was entertaining to an extent, just don't expect anything fantastic that you'd take away with you long after the film's concluded.